A suction-cup tile lifter has been used to remove a tile. A raised floor (also raised flooring, access floor(ing), or raised access computer floor) provides an elevated structural floor above a solid substrate (often a concrete slab) to create a hidden void for the passage of mechanical and electrical services. Raised floors are widely used in modern office buildings, and in specialized areas such as command centers, IT data centers and computer rooms, where there is a requirement to route mechanical services and cables, wiring, and electrical supply. Such flooring can be installed at varying heights from 2 inches (51 mm) to heights above 4 feet (1,200 mm) to suit services that may be accommodated beneath. Additional structural support and lighting are often provided when a floor is raised enough for a person to crawl or even walk beneath. In the U.S., underfloor air distribution is becoming a more common way to cool a building by using the void below the raised floor as a plenum chamberto distribute conditioned air, as has been done in Europe since the 1970s. In data centers, isolated air-conditioning zones are often associated with raised floors. 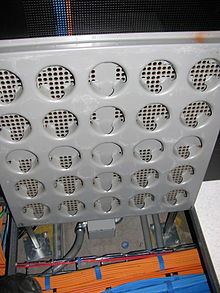 Perforated tiles are traditionally placed beneath computer systems to direct conditioned air directly to them. In turn, the computing equipment is often designed to draw cooling air from below and exhaust into the room. An air conditioning unit then draws air from the room, cools it, and forces it beneath the raised floor, completing the cycle. This type of floor consists of a gridded metal framework or substructure of adjustable-height supports (called "pedestals") that provide support for removable (liftable) floor panels, which are usually 2×2 feet or 60×60 cm in size. The height of the legs/pedestals is dictated by the volume of cables and other services provided beneath, but typically arranged for a clearance of at least six inches or 15 cm. The panels are normally made of steel-clad particleboard or a steel panel with a cementitious internal core, although some tiles have hollow cores. Panels may be covered with a variety of flooring finishes to suit the application, such as carpet tiles, high-pressure laminates, marble, stone, andantistatic finishes for use in computer rooms and laboratories. When using a panel with a cement top surface the panels are sometimes left bare and sealed or stained and sealed to create a tile appearance and save the customer money. This bare application is used most often in office atria, hallways, lobbies, museums, casinos, etc. Many modern computer and equipment rooms employ an underfloor air distribution to ensure even cooling of the room with minimal wasted energy. Conditioned air is provided under the floor and dispersed upward into the room through regularly spaced diffuser tiles, blowers or through ducts directed into specific equipment. Automatic fire protection shutoffs may be required for underfloor ventilation, and additional suppression systems may be installed in case of underfloor fires. Because the flooring tiles are rarely removed once equipment has been installed, the space below them is seldom cleaned, and fluff and other debris settles, making working on cabling underneath the flooring a dirty job. Smoke detectors under the raised floor can be triggered by workers disturbing thedust, resulting in false alarms. To remove panels, a tool with a suction cup on the end (referred to as a "floor puller", "tile lifter", or "suction lifter") is used. A hook-and-loop lifter may be used on carpeted panels. Structural problems, such as rocking panels and gaps between panels, can cause significant damage to equipment and injury to personnel. Regularinspections for the structural integrity of a raised floor system can help to identify and mitigate problems. Many such problems can be attributed to sub-par installation. During installation, attention should be paid to the condition of the subfloor, which should be clean of debris and should be as level as possible. The walls surrounding the raised floor should be as square as possible to minimize the need for cutting raised floor panels and to minimize rocking panels and gaps. The installation of a raised floor system can change the thermal behavior of the building by reducing the interaction between the heat gains and the thermally massive concrete slab. The raised floor serves as a separation between the room and the slab. Energy simulations of an office building located in San Francisco showed that the mere presence of the raised floor affects the zone cooling load profile and tends to increase the peak cooling load. When carpeting is present the negative impact of the raised floor on zone peak cooling load may be reduced. The general types of raised floors in telecommunications data centers include: stringerless, stringered, and structural platforms; and, truss assemblies. Stringerless raised floors — an array of pedestals that provide the necessary height for routing cables and also serve to support each corner of the floor panels. Stringered raised floors — a vertical array of steel pedestal assemblies (steel base plate, tubular upright, and a head) uniformly spaced on 2-foot centers and mechanically fastened to the concrete floor. Structural platforms — members constructed of steel angles or channels that are welded or bolted together to form an integrated platform for supporting equipment. Truss assemblies — utilizing attachment points to the subfloor to support a truss network on which the floor panels rest. The truss has high lateral strength and transfers lateral loads to the subfloor with less strain than possible with a vertical pedestal assembly. A telecommunications facility may contain continuous lineups of equipment cabinets. The most densely populated installation configuration would consist of rows of continuous 2-foot-wide equipment cabinets with aisles that separate 2-foot-wide adjacent rows. This lineup configuration is considered to be the most densely populated in terms of square foot area and, therefore, the largest floor load anticipated for a raised floor system. Considering prorated aisle space, a single equipment cabinet will then occupy an 8-square foot (0.74-m2) floor area (4 square feet for the cabinet and 4 square feet of aisle). The data center can be located in remote locations, and is subject to physical and electrical stresses from sources such as fires and from electrical faults. The environment drives the installation methods for raised floors, including site preparation, cable and cable racking, bonding and grounding, and fire resistance. The actual installation should be in accordance with the customer’s practices. Jump up^ Spinazzola, Steven (2005). "HVAC: The Challenge And Benefits of Under Floor Air Distribution Systems". Facilities Net. ^ Jump up to:a b Schiavon S, Lee KH, Bauman F, Webster T (2010). "Influence of raised floor on zone design cooling load in commercial buildings". Energy and Buildings. 42 (5): 1182–1191.doi:10.1016/j.enbuild.2010.02.009. Jump up^ GR-2930, NEBS™: Raised Floor Generic Requirements for Network and Data Centers, (Issue 2). July 2012.